What do you know - another debut! 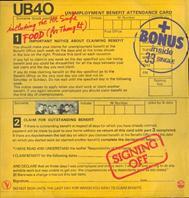 This dub infused reggae album by the Brits in UB40 not only sports some very good songs, but also some damn good songs. This is a far cry from their later years' Red Red Wine-style reggae and more in pa with the frustration that made them take their name from the unemployment form. Sadly it starts to falter towards the end of the album as Madame Medusa doesn't really com together as nicely as it needs to (there's just something about Ali's voice) and their cover of Strange Fruit is nowhere near Nina Simone's version. And even though it's an unfair standard to be compared to I can say that even without that comparison the cover's not that good. But let's not dwell on the lesser material, cause Signing Off's got a great song in Burden Of Shame (where I hear echoes of Van Morrison's Moondancey) and the title track. So the album gets its go ahead as an album to listen to, cause this is how the UB40 should sound.